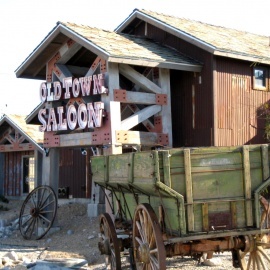 If you would like to relive the 1800's, when mining in Nevada was at it's peak, be sure and stop in to the Old Town Saloon. When entering, be sure to take a look at the old horse-drawn wagons, the dry riverbed, and the replica of an old Southwest mining derrick that embellishes the front entrance to one of Laughlin's finest watering hole. Be it cocktail, trying your luck at gaming, or just coming in to view the many photo's depicting the area of years gone by, do stop in, you're always welcome. We are now 100% country bar, where you will find line dancing lesson during the week. Live entertainment every Saturday night as well as Ladies nights are EVERY friday night with $1 drinks (well,domestic draft, and house wine). If you're into NASCAR, NFL, NBA, then the Old Town Saloon is the place to be. 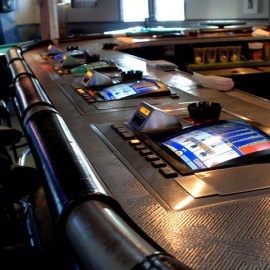 You can view your favorite sport from any place in the establishment, while gaming, throwing darts, playing pool. There is always something good going on for your enjoyment. Old Town Saloon features IGT Video Poker machines with Multi-Denomination and Multi-Game capabilities featuring all the popular video poker games, as well as blackjack and reel games, for your gaming pleasure. AND ALWAYS FREE DRINKS TO PLAYERS!